Hamed, his wife and youngest son picked me up from Bethlehem, where he ha d been for a meeting. As we sped into Hebron I noticed a fast food outlet I had not seen before. It was KFC! I am not a fan of KFC, but it was good to see them in Palestine all the same. Hamed Qawasmeh has been working in the South of the West Bank over the past 10 years in the capacity of the Director of the Public Relations Department at Hebron’s Governor Office, then as the Field Officer at OCHA and then as the Director of the UN’s Office of the High Commissioner for Human Rights (OHCHR)’s office in the south (including Bethlehem and Hebron Governorates). 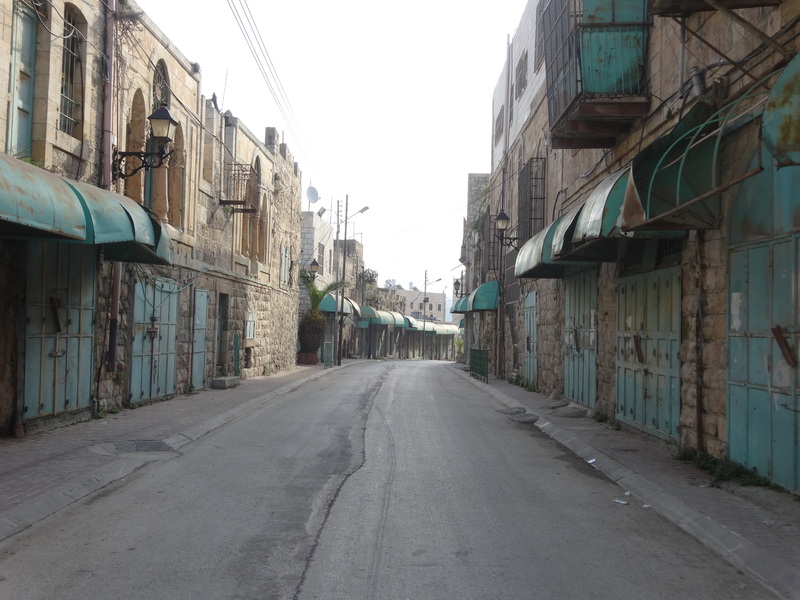 I accompanied Hamed to his various appointments that day in and around Hebron. I did feel a bit like a lemon at times as I attended meetings, conversations and PA administration all in Arabic, apart from Hamed’s explanations which were very informative. However Hamed explained that I was in fact performing an important role as token international, with camera, phone and presence. It helped to smooth his way when officialdom felt scrutinised, even Palestinian officialdom! I had wondered why Hamed had held onto me when I suggested waiting outside or wanted to use the toilet! In the morning I attended a meeting with a number women from South Hebron Hills villages in discussions with the Hebron Municipality as to how to give them more community facilities despite the close presence of Israeli settlements who want to push them out. Then we visited a man living in Area C whose house had been demolished by Israel and his animal pens also destroyed. Hamed had been instrumental in building another home 30 metres from the original. He explained that if the new house was in the same location Israel could use the same demolition order, but the new location meant they would have to start again. It was important to keep a house occupied on this small hill to try to avoid yet another Israeli settlement forming there. It was therefore important to get the house properly registered with the Palestinian Municipal Authority, not to prevent demolition, but to make it possible to delay one by going to court. It seems my presence eased the way. The same thing applied to paying the necessary money to enable Palestinian students to go to university in Hebron and Jordan. It was all very bureaucratic. 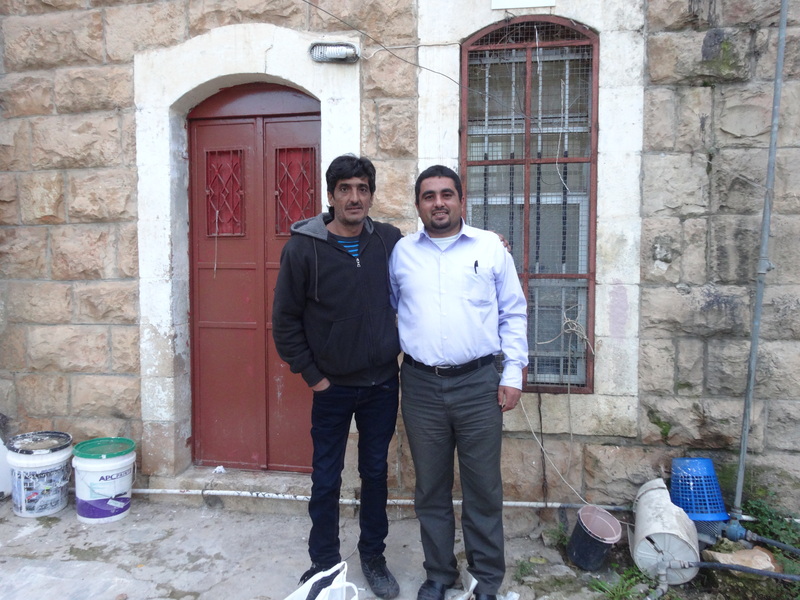 I was taken to a bank where Hamed took out and exchanged money from Shekels to Jordanian pounds in order to pay the university fees of students from Hebron who could not afford to pay them. This entailed several visits including Hebron University. We also visited Cordoba School in Tel Rumeda (Area H2) where improvements were being made to the toilet units in the playground area. While there he showed me the new kindergarten a short distance from it. Finally He dropped me off close to the Old City of Hebron where I met Badia who took me back into Tel Rumeda to visit and to show me some of the issues experienced by the Palestinians living there. You can see Badia standing in front of Imad’s home that was flooded because of the effect that the IDF view point situated on his roof has had on his property. In the two photos below you can see all the wire mesh covering his garden around his house. If you look closely you can see some stones on top of the wire. These were thrown at his property by his Israeli settler neighbours. All the Palestinians in this area need metal grills on their windows and the protection of wire mesh around th eir houses because of the very frequent attacks from the settlers around them. Badia is a member of a group called Human Rights Defenders, which is a grassroots, non-partisan Palestinian organisation working to support nonviolent popular resistance through popular direct action and documentation of human rights violations committed by the Occupation. It is described as a project aiming to document violations by the Israeli occupation through the distribution of cameras to Palestinian families in areas where violations occur on a continual basis. Such documentation will expose how these Israeli practices violate international law. It was very interesting to see the ordinary lives of Palestinians and how the occupation affects them all in one way or another. I was so well looked after by Naheel and Issam, whom I stayed with for 2 nights. It was wonderful to stay with Palestinians trying to live ‘normal’ lives and being in troduced to Naheel’s large family in their homes nearby, as well as to eat their wonderful food! In the photo you can see the famous Palestinian dish Maklouba, which means ‘upside down’. It is a chicken or mutton and rice dish with either cauliflower or aubergines and nuts or raisins (variations on the theme), cooked in such a way that it had to be emptied from the large pan upside down onto a huge communal dish. It is delicious and Stephen, my husband and me, sometimes make it (badly) here in the UK!